Knowledge, not guns or knives, is by far the best weapon. We use it to out-think our other halves in an argument to try and turn the tide of war: "I know you told Stephanie, who told Janet and her husband Bill, that you wanted a divorce; well Buster, I've already got the papers drawn up. Get ready to move back in with your parents!" You can use knowledge in a less destructive way, too, perhaps to win money on a game show like Jeopardy or save a person's life by performing the Heimlich maneuver on a person choking at a restaurant. Regardless of how you use knowledge, just having a little bit can save you some serious bread, too. For instance, if you've read, memorized, or mastered the information provided by "The Motorcycle Fuel Systems Techbook" by Haynes, you've probably got a leg up on any problems that might arise on your bike in the garage. Haynes is known for giving detailed pictures and captions on how to tear apart and rebuild most anything, and this book is no different. The author, John Robinson, has spent a really good deal of time racing, riding, tuning, and working on motorcycles. 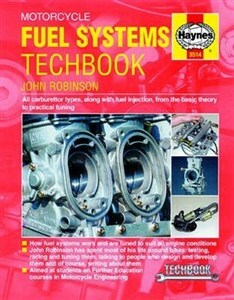 He knows a few tricks and tips to help you get the fuel flowing smoothly, and this book will help you do the same.